I've taught in many different settings. I started with 5th graders in a dropout prevention program and I'm currently teaching gifted 2nd graders. In between I've taught just about everything else. I've tried many different behavior management strategies along the way with varying degrees of success. Last summer I was on a quest to simplify the whole deal and what I stumbled upon was genius! It was one of those "Man, why didn't I think of that?" moments. Again, my fab friends at ProTeacher.net are the ones who turned me on to this. It's the Clip Chart Management System. The beauty of this system is the simplicity. The real selling point was that it allows children to redeem themselves during the day and allows me to reward positive behavior. I am of the firm belief that you catch more files with honey and this plan really allows for that. In this system, the words at each level are more significant than the color. Basically, the students start on "Ready to Learn" which is in the middle of the chart. I love that this eliminates that false sense of accomplishment for being on "green" or the highest level just for walking though the door, and then having no where to go but down. It is completely fine for a student to remain at Ready to Learn all dang day, but now you can recognize and differentiate for students who go above and beyond. Now your ok/quiet/usually-on-task student and your always-ready/super-helpful/ultra-responsible students are no longer on the same level. It doesn't cost anything to implement. Teachers Choice allows me to choose an immediate consequence proportionate to the action and student. 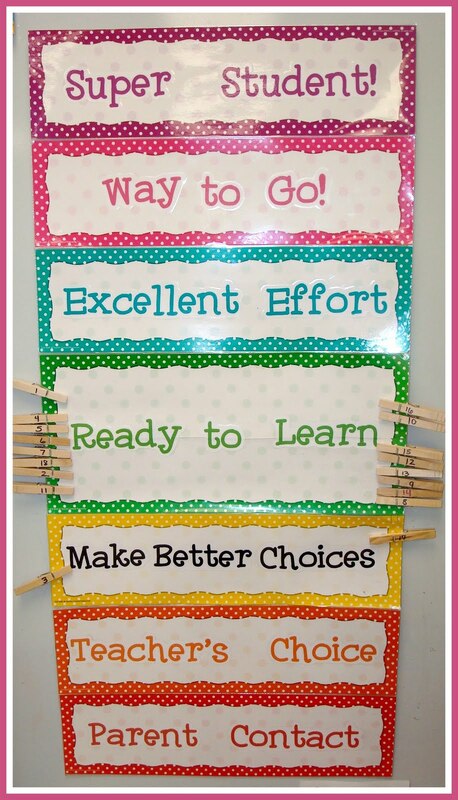 The chart is easily modified to your classroom theme, expectations or grade level. Here is a link to the program. It's a free e-book that will really explain it all. If you like my chart, Click here and here to get a copy of the titles.I printed them, trimmed them and then attached them to these headers before laminating the whole thing. 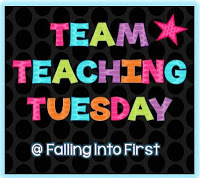 Find some more great classroom management ideas on Falling into First's Team Teaching Linky! I love that report! I struggled a bit this year with the best way to inform families of how their child was doing. I really, really like this form! That's exactly why I love the clip chart! I'm glad you like the form. I have the kids keep it in their agenda and give it a quick check in the morning. I have them make a little check mark next to each step they moved to. Of course, I explain it at open house so the parents know what it means. I can't imagine not using this system now! I love the idea of moving up. We have a grade level wide clipchart, but it is the kind where you start on green and move down. They can move back up but I love the idea of moving up too. This is such a great idea! I am DEFINITELY going to try it out this year! Quick question, on the polka-dot headers, did you put 2 greens together to make it wider? Did the set come with 2 greens or do I need to order 2 sets? Thanks Sunny! We may be in different grade levels, but I get so many wonderful ideas from you! What I love most about this is that it rewards the positive too! So much I feel as if we make sure the kids who had issues know it, but the kids who do great don't! I am so going to make this today... I can't even wait! Ok... maybe I will wait until after my conference next week. =) I am going to link it to my blog if that's ok.. so my friends can see too! It's going to be the newest craze at my school I know it! Ooh, thanks for the link to the linky! Heading there right now! 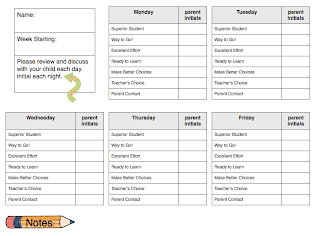 I am so wanting to implement this next year after seeing so many blogs with it-I've even been fiddling around with a report sheet or redirection sheet-I'm not sure I understand how your students mark on their sheets--If they go up, do they put a check mark or something? What happens if they go up and then go down? I like the words you use for your chart too! I actually do the sheets myself for a month or so, till they get it. It only takes a second. But basically say a kid moves from ready to learn to make better choices, I would just make a little down arrow from ready to learn to make better choices in the space after the words. Then if they move up, Id basically make another one next to it going up. Does that make sense? I'll try to draw on one on the computer and post it :) Really they can check mark it too. It would be obvious to the parents that they moved up or down during the day. I was just trying to avoid a kid bringing home a note that showed only ready to learn marked when maybe they had gone down to teacher's choice, but then was able to move back up, ya know? Could I get a copy of what you do for the month, that is the way I prefer to do behavior too, I save paper and my sanity, one less thing to do EVERY week. I was trying to create something but not sure how I feel about it. I like the idea of showing the ups and downs of the day as you mentioned and my form doesn't allow for that. Thanks for the wonderful idea, I can't wait to use it this year. Also is there any way to get your headers in Word I need to change the wording of a few. Thanks for explaining that! That totally makes sense. 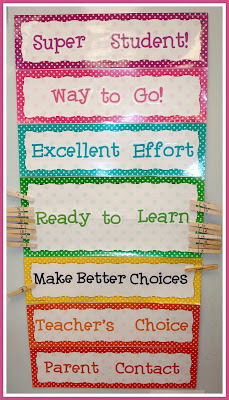 I was wondering the same thing about if a child clips down to teacher's choice but then goes back up, how does that show their entire day if it started off yucky--I like the arrow idea-I was thinking of way to keep track myself so I have documentation for their files or for when parents have questions! I would like to add that you can buy these polka dot headers for $6.99 on Amazon and if you have Amazon Prime, then it's free shipping!! This is great! I'm going to try this new this year. I too have felt that my old system, where everyone already started on green and could only work their way down, didn't recognize the efforts of all my kids that give me a 110% each day. I definitely think this new system is going motivate my students to all work a little harder to "clip up" each day! Thanks for sharing yours...it's super cute! Oh, I love this idea! I have never see anything like it before! Thank you soooo much for sharing!!! This is so smart! Much better than the move-a-card charts! I'm home with my own kids these days, but I'll definitely save this for whenever I go back to teaching! Thanks! This is absolutely fabulous. I used the chart in my classroom this past year, it was a makeshift one I handmade. Thanks for sharing all of this! I used this is 1st grade last year and love it (although yours is much cuter)! It works great and really motivates the students! I used markers to make a line when they got to the top and when they had 10 marks, they got a prize from the treasure chest. It was so effective! I definitely recommend it! I love this idea and just bought the polka dot paper. I was wondering if there was any way to get the headers sent to me in word. Thanks. I'm a first year teacher and just wanted to thank you for sharing this!!! Is there any way you could email me the word doc of the communication form so I can edit it if I need to? I would appreciate it so much, If not it is okay. I was just wondering. I made my own this past weekend with your titles. Can't wait to post it. Thank you, thank you, thank you!! You've saved me so much time creating a report chart for my parents!! What do you think would happen if I laminated something that was already laminated?? Is that a bad idea??? I love the idea of the clip chart! I am thinking of using it in my Kindergarten classroom. I would like to communicate this with parents everyday but I am not quite sure how to do it. I like your behavior sheet but it seems like a lot for me to do for 26 crazy Kindergarteners! I would have to be the one to do it and and I already don't even have enough time to even sit down during the day. I would love suggestions from anyone out there! Great clip chart! I included it in a recent blog post and linked it back to here. I hope that's okay! Your clip chart is a thing of beauty! Definitely inspired me to create my own, and made me wonder where it had been all year when I needed it most!! I am a new blogger, so come check out my shout-out to you on my blog! What a cute clip chart! Thank you for sharing how it works and how you use it in your class. Thanks for linking up! I love this and am going to implement it this year! How did you hang it on the wall? I love this chart!!! I just moved to 2nd grade last year (after 2 years in kinder) and struggled with a way to make a clip system work, especially because we are departmentalized. I always felt bad for punishing students who bahaved in my class but not in the other. Now the parents will see the good things they do! Do you offer any type of reward (treasure box, extra activities,etc)? Do you reward the students if they're on ready to learn at the end of the day even though they moved down the chart during the day? Thank you for submitting this to the new teacher experience blog carnival! 300th Follower Giveaway - Everybody wins! Top Ten Things About Me!